Did you know that most dinosaurs hate Christmas? It’s true, they do. And it’s not because they couldn’t get a handle on the present wrapping (or unwrapping for that matter) either. No, there is a very good reason why Dinosaurs hate Christmas. 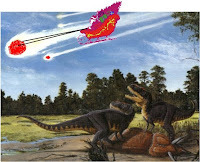 However, before explaining why dinosaurs hate Christmas, lets deal with some startling new information. 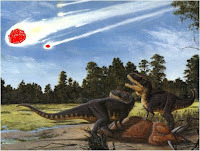 Everyone is familiar with the standard explanation for the extinction of the dinosaurs. I've included a common representation of the event. However, startling 'evidence' has been presented which suggests another reason for what happened. The evidence is still officially hidden by the authorities, but one startling image has been smuggled out and is shown here for the first time. It is claimed that it was an early experiment on propulsion systems that went wrong and had to be ejected. Shocking as this image is, there are some who claim that it is a forgery and just another shot by those at war with Christmas. However, this is not the reason that dinosaurs hate Christmas. To understand that we need to know what dinosaurs are. a group of exceedingly large, pachydermous reptiles from the Second Age . . . includes Megalosaurus, Iguanodon and Hylaeosaurus. the last common ancester of Megalosaurus andIguanodon and all its descendants. If it's changed since then, blame Holtz, but any changes will be mainly deckchair shuffling on the SS Chicxulub. Anyhow, the thing about this definition is that, nestled between the Megalosaurs and the Iguanadons, are the Dromaeosaurs, and directly related to the Dromaeosaurs, and so one of the descendants mentioned above, is a little group called Aves! So with the mass slaughter of birds dinosaurs every Christmas, wouldn't you hate Christmas? 1. If your dinosaur is frozen, fully thaw it. 2. Don’t stuff the dinosaur. By the time the stuffing reaches a safe temperature, the meat is overcooked. 3. Cover the dinosaur breasts with ice while the rest of the dinosaur warms to room temperature. Don’t leave the dinosaur out for more than 3 hours. At this point, the breast will be about 40o Fahrenheit, while the rest of the meat will be at 60o Fahrenheit. 4. Put the dinosaur in the oven and cook according to your favorite recipe. 5. With a meat thermometer, check temperature. Take out of the oven when legs reach 82 Cedntigrade (180o Fahrenheit) and breast hits between 68 and 71 Centigrade (155o and 160o Fahrenheit). Damn my T Rex won't fit in my oven! What's with the outdated Fahrenheit? You applying for American citizenship? Happy Monkey to you and yours! Actually I thing the original was British, so there! As the majority of Ediacaran readers are from the US and Canada, so I had to acknowledge that. I was going to add in the correct temperatures scale, but . . . hey . . . the festivities has started and the very nice Tasmanian Jantz champagne was seducing me away from the keyboard . . . and when the Lindt chocolates got involved, well . . .
Of course, I should have said that the post did not apply to yellow and green dinosaurs. In your very nice Christmas massage you said that you were refraining from eating anyone over the Christmas period, yet had a dinosaur cooking on the fire! Although, to be fair, you didn’t mention refraining from killing and cooking, just eating. So, preparing for Boxing Bay cold cuts then? Sorry to use registration, but the site is plagued with link spanners. Please either sign in or send your comment by email and I'll add it to the site. Palaeontologist, interrupted. In a previous life I worked on Ediacaran and Early Cambrian palaeontology, palaeoecology and taphonomy. While doing all that I also discovered talk.origins . . . the rest was history. I subsequently moved on to a real job, mainly because they pay me. And for the lawyers, this blog represents my opinions only and not those of my employer.